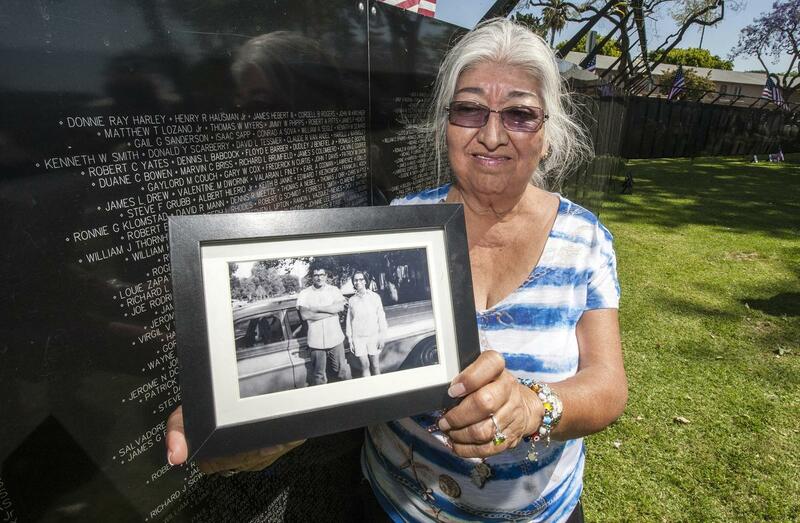 BUENA PARK – With memories of lost family members and friends on their minds and mementos to leave, members of the public visited a traveling replica of the Vietnam Veterans Memorial on display in Buena Park. 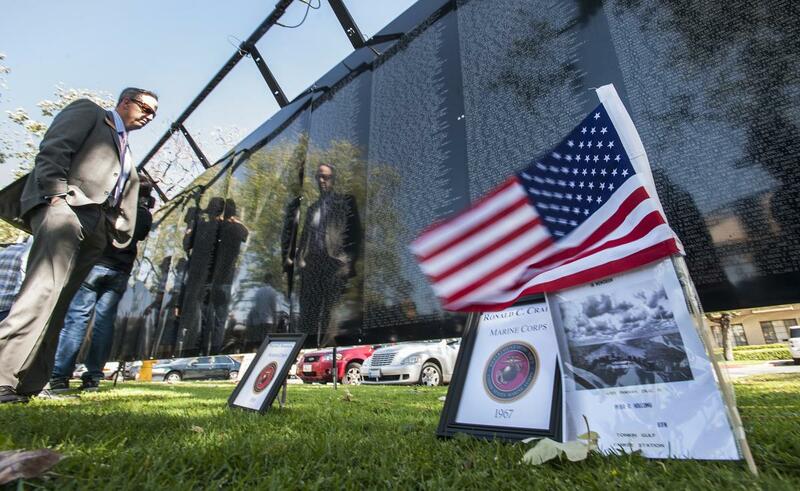 The Wall that Heals, a 250-foot-long, half-scale replica of the Washington, D.C., monument, will be on display 24 hours a day at the Ehlers Community Center, 8150 Knott Ave., through Monday. An opening day ceremony was held Thursday at which Mayor Art Brown said he saw families with photos of their loved ones and some with younger children to show them what their uncle or grandfather did for the country. 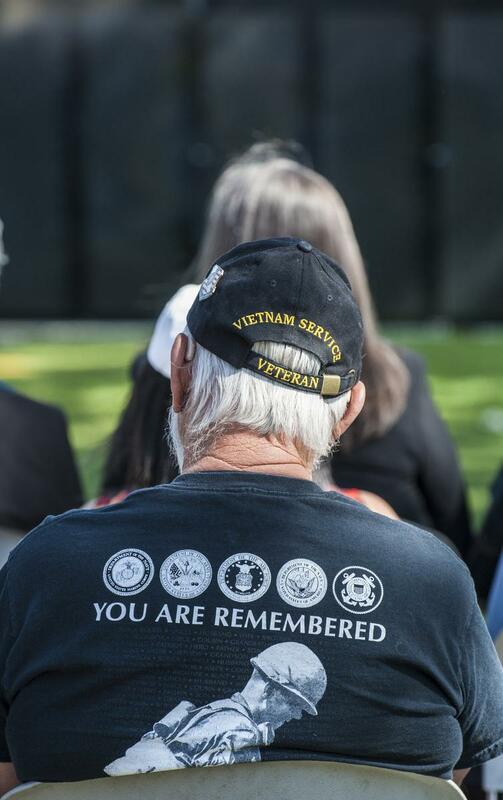 “We had a lot of thanks from the veterans for bringing the wall here,” said Brown, who remembers his own feeling of being in the “presence of something great” when he visited the memorial in D.C.
A flag flies in the breeze as Vietnam veterans and members of the public attend the opening day for The Wall That Heals, a 250-foot replica of the Vietnam Veterans Memorial, along with a mobile Education Center, at the Walter D. Ehlers Community Center in Buena Park Thursday morning. 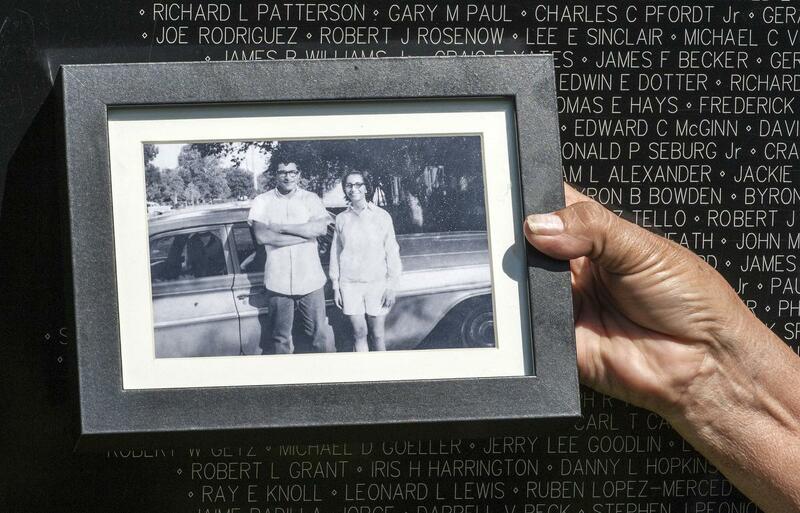 Vickie Elizalda of Garden Grove, holds a photograph of her brother, Joe Rodriguez, who stands with his sister-in-law, Diana Cummings, in Austin, Texas, before he went to Vietnam. 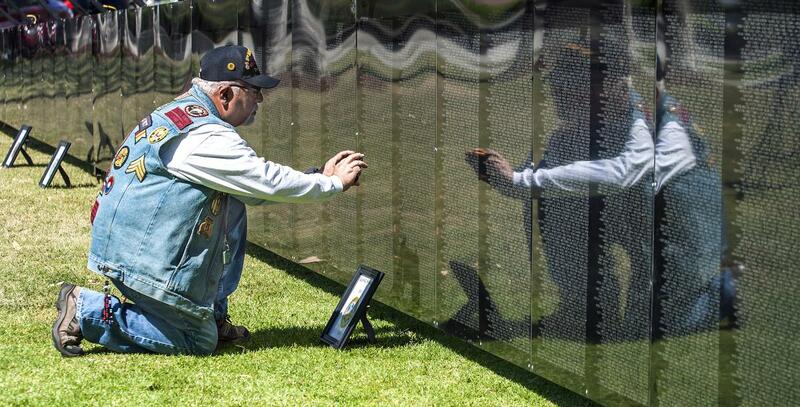 Elizalda came to find his name on The Wall That Heals, a 250-foot replica of the Vietnam Veterans Memorial, at the Walter D. Ehlers Community Center in Buena Park Thursday morning. Chuck Giambitti of Fullerton, who served in Vietnam in 1968-69, takes a photo of two high school classmates from Inglewood High School whose names are on the The Wall That Heals, a 250-foot replica of the Vietnam Veterans Memorial, at the Walter D. Ehlers Community Center in Buena Park Thursday morning. 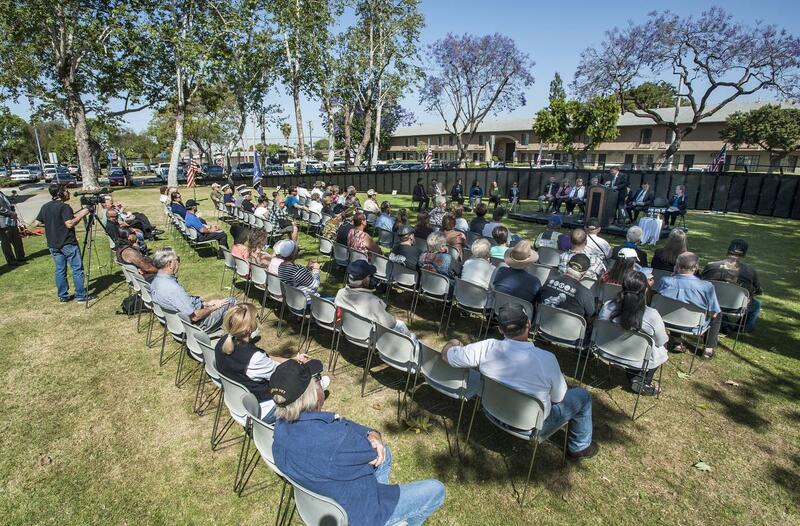 Vietnam veterans and members of the public attend the opening ceremony for The Wall That Heals, a 250-foot replica of the Vietnam Veterans Memorial, along with a mobile Education Center, at the Walter D. Ehlers Community Center in Buena Park Thursday morning. 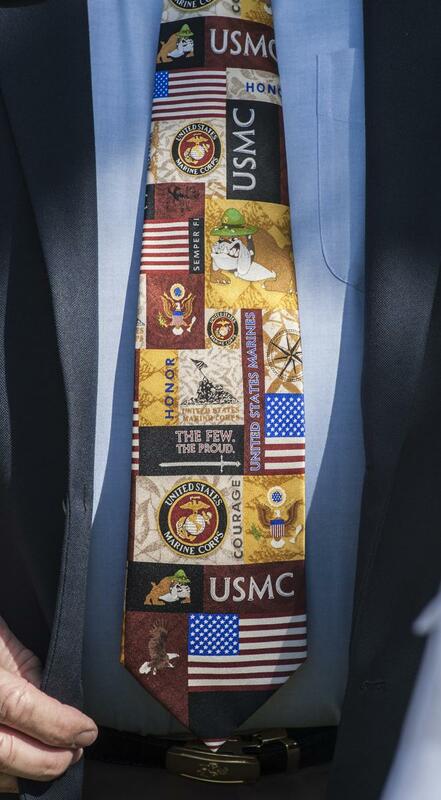 The tie of Art Brown, mayor of Buena Park, as he and Vietnam veterans and members of the public attend the opening ceremony for The Wall That Heals, a 250-foot replica of the Vietnam Veterans Memorial, along with a mobile Education Center, at the Walter D. Ehlers Community Center in Buena Park Thursday morning. 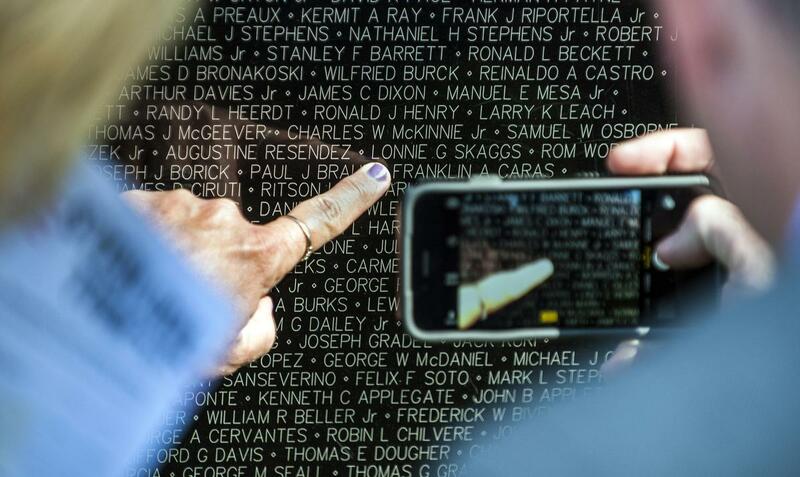 A name is found on The Wall That Heals, a 250-foot replica of the Vietnam Veterans Memorial, at the Walter D. Ehlers Community Center in Buena Park Thursday morning. 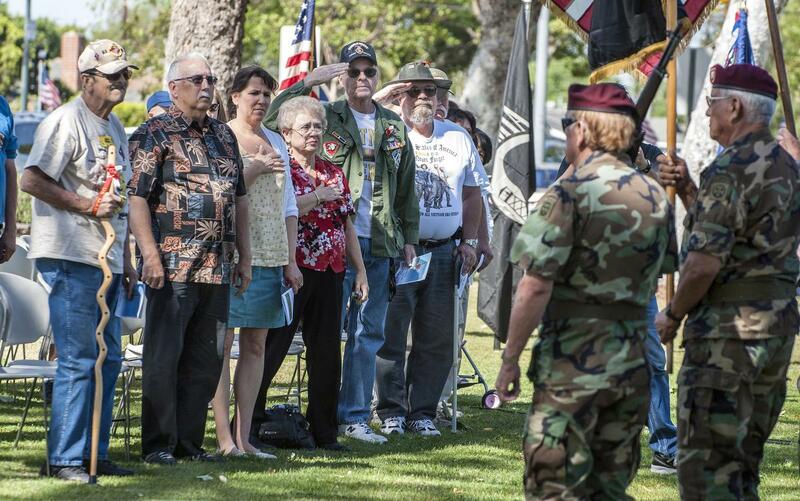 Vietnam veterans and members of the public stand for the Pledge of Allegiance as they attend the opening ceremony for The Wall That Heals, a 250-foot replica of the Vietnam Veterans Memorial, along with a mobile Education Center, at the Walter D. Ehlers Community Center in Buena Park Thursday morning. 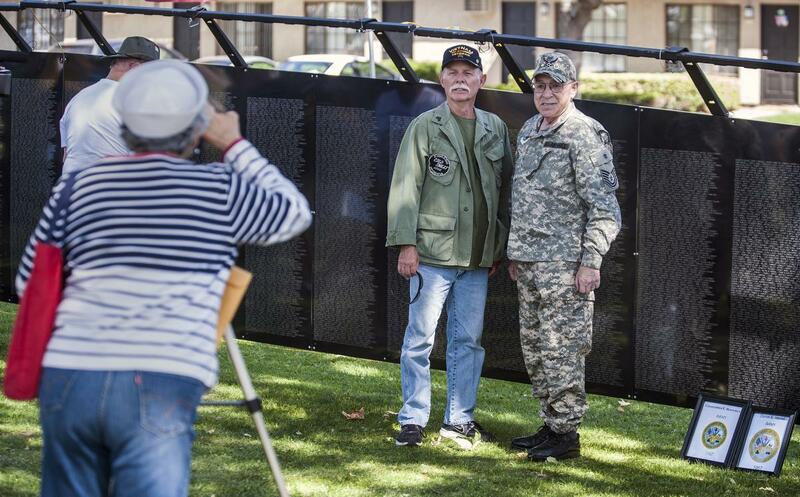 Roger Williams, left, of Cypress, who served in Vietnam in 1970-71, stands with Wally Recio of Anaheim, who served in 1966-67, as they have their photo taken in front of The Wall That Heals, a 250-foot replica of the Vietnam Veterans Memorial, at the Walter D. Ehlers Community Center in Buena Park Thursday morning. Chuck Giambitti of Fullerton, who served in Vietnam in 1968-69, finds two high school classmates whose names are on the The Wall That Heals, a 250-foot replica of the Vietnam Veterans Memorial, at the Walter D. Ehlers Community Center in Buena Park Thursday morning.